Here is the Mathematical Brain Teaser which will test not only your Mathematical skills but also your visualization skills. 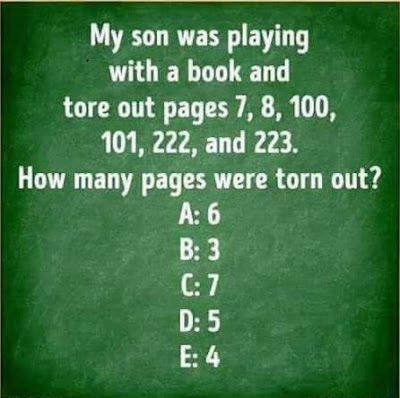 In this Maths puzzles, the pages torn by a boy is given. You have to imagine the position of these pages visually in your mind and then solve this picture puzzle as quickly as possible. Can you solve this quick Math Puzzle? The Answer is 5 Pages. Considering the 1st page starts on right hand side, then page 2 is printed on the back of first page. It means that any two consecutive odd-even numbered pages will fall on the same page while two consecutive even-odd page will fall on two different consecutive pages. So considering this 5 pages of the book were torn by boy. Er, my initial thought was three and was about to call you a twit. But, having physically checked this – I whole-heartedly apologise!